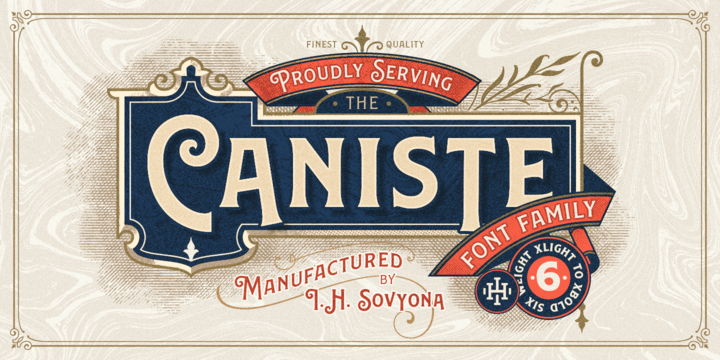 Caniste is a modern vintage typeface created & published by Ilham Herry which it is available in 7 styles, 6 weights (from XLight to UBold) and an useful Extras. Inspired by antique ephemera in comes with a standard alphabet, stylistic alternates and extras which you can made interesting things. It is ideal for typographic use, if you are looking for the beauty of those times. Quality makees the value! Price: starting from $20,00 for one font to $60,00 for all 7 fonts. A font description published on Friday, March 23rd, 2018 in Fonts, Ilham Herry, Ilham Herry by Alexandra that has 1,790 views.